Significant improvement over the old neighbor. skin condition? Yes, she is. 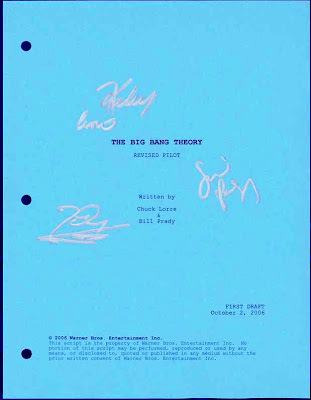 a copy of the pilot script signed by Kaley, Johnny, and Jim. 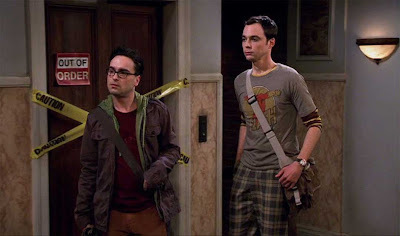 Pilot episodes are tricky things - characters often aren't quite defined yet, and there are one or two lines in the Big Bang Theory pilot that I think most fans quietly agree are not truly canon. the pilot script can be even further removed from what the show becomes. It's been widely discussed that the first pilot for TBBT featured a Penny character who was a kind of tough goth chick (or punk, or something like that. I forget). I believe this was even filmed, but it just didn't work, and they recast with Kaley Cuoco in the role. Did you get that? Sheldon's first impression of Penny was that she is incandescently attractive! I'll let you know if I come across any more little gems in the script. I've stated before that I like the TV show Flash Forward. If you follow me on twitter (@fancollectrgeek) you know they often shoot in places I go in real life - a bird store, a diner that doubled as both a coffee shop and a cocktail lounge within ten minutes on the show, and the hospital, which is actually an office building much of my work takes place in. 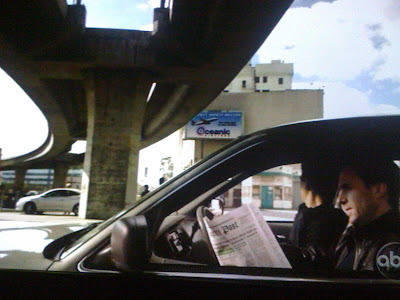 Now, above, they've created my favorite Fake-Address-You-Aren't-Even-Really-Supposed-To-Read: 946 Avenue Street. How perfectly generic! This is one of the things I enjoy about watching on a huge projector screen, you can catch little details. The fairly recent suicides of Marie Osmond's son Michael Blosil and Walter Koenig's son Andrew both seem to have been related to chronic depression. It's a terrible shame to lose them both to that, but it's difficult to understand how extreme chronic depression can be, how it can take over and sour your thoughts. I am lucky enough to have recently realized I was depressed to an extreme point: the depths my spirits had sunk to were far, far more extreme than the situation I found my life in called for. I say I'm lucky to have realized this because I spoke to my doctor and found it easily treatable - I am much better, feeling myself, and able to handle things emotionally in a reasonable manner. to fall into: if you have any fond memories attached to it, it becomes easier to just find a box or a corner to shove the item into than to decide to get rid of it. 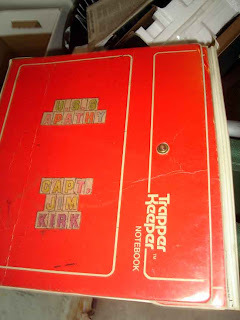 I was holding onto this ratty old Trapper Keeper for decades, just because it bore the name in stickers of the ship from a Star Trek parody comic book I wrote in high school. U.S.S. Apathy. (Get it? Apathy is an antonym of Enterprise. Ha.) When I came across it recently, I was able to chuck it out, but took this photo just in case I ever wanted to gaze on it fondly again. Actually, I found it more useful here in the blog than I feel any sense of nostalgia on viewing it. Hoarders are interesting, and there's a show on A&E that tries to help a couple of them clean up their act every week. (Be careful with that link - every time I go to the page the preview blasts me with static. Just skip it.) It's a bit heavy handed and grim, and I've found it very repetitive after watching several shows, but it can still be fascinating to look at what people get themselves into. I used to study these shows with a "there but for the grace of God go I" attitude, always finding it easier to clean out the closet a bit after viewing. This image shows the clutter of a beer can collector - over 55 thousand cans in boxes littering his house - being transferred to the shelves long ago made for their display. (Apparently to the psychologist on site, organization is the difference between a collector and a hoarder. 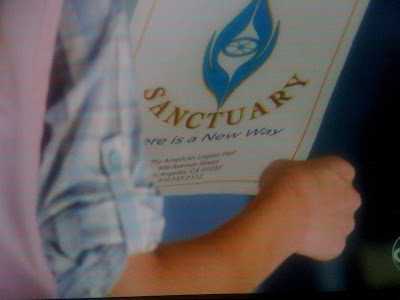 I think that's simplifying it a bit...) you can see a clip from this show here. After a short Nyquil commercial. Sigh. I'm rambling a bit here, but I guess my most important message is if you find yourself extremely depressed, talk to someone, at least your doctor. I'd relate that to collecting, or feeling like a geek, but there's really no reason to qualify it. Why the Star Trek books up top? When my friend Bruce passed away, I inherited his set of all the autobiographies of the Star trek cast. They each wrote one except for DeForest Kelley, who passed away before they got started. 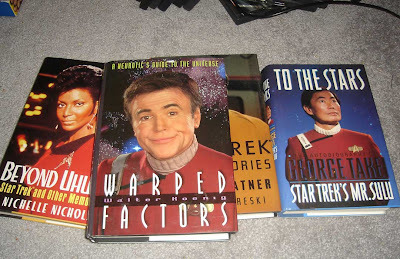 I read them all, and Walter Koenig's just happened to be the best read, followed by James Doohan's, which I seem to have misplaced. George Takei's was okay, but it was written before he came out of the closet, and I was reading it after, so it suffered from obvious omissions of any romantic life at all, and allusions to minor encounters with women as bigger than they were. I honestly think he'd do well to rewrite it in an expanded, more honest version - not sordid or illicit, but, well, if it was tough to be a Japanese-American growing up in mostly hispanic East L.A. after World War II, it must have been even harder to be gay also. Thanks for listening. I'm always glad to hear your thoughts in comments or at fancollectorgeek@earthlink.net. I will be back with more on a lighter note very, very soon - no more month long breaks!